This article is about natural and constructed phenomena and structures of the world. For other uses of "Wonders of the World", see Wonders of the World (disambiguation). 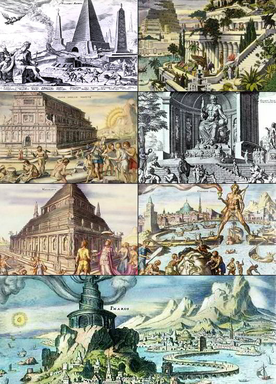 The Seven Wonders of the Ancient World (from left to right, top to bottom): Great Pyramid of Giza, Hanging Gardens of Babylon, Temple of Artemis at Ephesus, Statue of Zeus at Olympia, Mausoleum at Halicarnassus (also known as the Mausoleum of Mausolus), Colossus of Rhodes, and the Lighthouse of Alexandria as depicted by 16th-century Dutch artist Maarten van Heemskerck. Various lists of the Wonders of the World have been compiled from antiquity to the present day, to catalogue the world's most spectacular natural wonders and manmade structures. The Seven Wonders of the Ancient World is the first known list of the most remarkable creations of classical antiquity; it was based on guidebooks popular among Hellenic sightseers and only includes works located around the Mediterranean rim and in Mesopotamia. The number seven was chosen because the Greeks believed it represented perfection and plenty, and because it was the number of the five planets known anciently, plus the sun and moon. Many similar lists have been made. The historian Herodotus (484 – c. 425 BC) and the scholar Callimachus of Cyrene (c. 305–240 BC), at the Museum of Alexandria, made early lists of seven wonders. Their writings have not survived, except as references. Great Pyramid of Giza, the only one that still exists. In the 19th and early 20th centuries, some writers wrote their own lists with names such as Wonders of the Middle Ages, Seven Wonders of the Middle Ages, Seven Wonders of the Medieval Mind, and Architectural Wonders of the Middle Ages. However, it is unlikely that these lists originated in the Middle Ages, because the word " medieval" was not invented until the Enlightenment-era, and the concept of a Middle Age did not become popular until the 16th century. Brewer's Dictionary of Phrase and Fable refers to them as "later list[s]",  suggesting the lists were created after the Middle Ages. Following in the tradition of the classical list, modern people and organisations have made their own lists of wonderful things ancient and modern. Some of the most notable lists are presented below. Channel Tunnel December 1, 1987 May 6, 1994 Strait of Dover, between the United Kingdom and France The longest undersea portion of any tunnel in the world. CN Tower February 6, 1973 June 26, 1976 Toronto, Ontario, Canada Tallest freestanding structure in the world 1976–2007. Empire State Building March 17, 1930 April 11, 1931 New York City, New York, U.S. Tallest structure in the world 1931–1954, Tallest freestanding structure in the world 1931–1967, Tallest Building in the world 1931–1970. First building with 100+ stories. Golden Gate Bridge January 5, 1933 May 27, 1937 Golden Gate Strait, north of San Francisco, California, U.S. The longest suspension bridge main span in the world from 1937 to 1964. Itaipu Dam January 1970 May 5, 1984 Paraná River, between Brazil and Paraguay The largest operating hydroelectric facility in the world in terms of annual energy generation. Delta and Zuiderzee Works 1920 May 10, 1997 Zeeland, South Holland, North Holland, Friesland and Flevoland, Netherlands The largest hydraulic engineering project undertaken by the Netherlands during the twentieth century. Panama Canal January 1, 1880 January 7, 1914 Isthmus of Panama One of the largest and most difficult engineering projects ever undertaken. 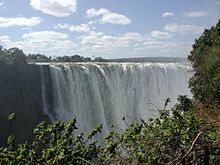 New7Wonders of Nature (2007–2011), a contemporary effort to create a list of seven natural wonders chosen through a global poll, was organized by the same group as the New7Wonders of the World campaign. New7Wonders Cities is the third global vote organized by New7Wonders. The Seven Underwater Wonders of the World was a list drawn up by CEDAM International, an American-based non-profit group for divers, dedicated to ocean preservation and research. Seven Wonders of the World is a 1956 film in which Lowell Thomas searches the world for natural and man made wonders and invites the audience to try to update the ancient Wonders of the World list. World Heritage List – a list of over 900 sites deemed by UNESCO to be of "outstanding universal value"
^ Both the USA Today article and the Good Morning America broadcast described this wonder as "Jerusalem's Old City, Israel." The Old City is located in East Jerusalem, which is claimed by both the State of Israel and the State of Palestine. The UN and most countries do not recognize Israel's claim to East Jerusalem, taking the position that the final status of Jerusalem is pending future negotiations between Israel and the Palestinian Authority. See Positions on Jerusalem for more information. ^ Anon. (1993). The Oxford Illustrated Encyclopedia (First ed.). Oxford: Oxford University. ^ a b Evans, I H (reviser (1975). Brewer's Dictionary of Phrase and Fable (Centenary edition Fourth impression (corrected) ed.). London: Cassell. p. 1163. ^ a b Hereward Carrington (1880–1958). The Seven Wonders of the World: ancient, medieval and modern, reprinted in the Carington Collection (2003). ISBN 0-7661-4378-3. ^ The Carrington Collection. Retrieved October 29, 2014. ^ Latham, Edward (1904). A Dictionary of Names, Nicknames and Surnames, of Persons, Places and Things. p. 280. OCLC 01038938. ^ Miller, Francis Trevelyan; Woodrow, Wilson; Taft, William Howard; Roosevelt, Theodore (1915). America, the Land We Love. p. 201. OCLC 00334597. ^ The Complete Idiot's Guide to the Crusades. 2001. p. 153. ^ "Cluny Abbey". The Catholic Encyclopedia. 16. 1913. p. 74. OCLC 06974688. ^ The Rough Guide To England. 1994. p. 596. ^ Palpa, as You Like it. p. 67. ^ "American Society of Civil Engineers Seven Wonders". ASCE.org. July 19, 2010. Archived from the original on August 2, 2010. Retrieved August 30, 2010. ^ American Society of Civil Engineers. "Seven Wonders of the Modern World". ASCE.org. Archived from the original on April 2, 2010. ^ "New Seven Wonders panel". USA Today. October 27, 2006. Retrieved July 31, 2010. ^ Clark, Jayne (December 22, 2006). "The world's 8th wonder: Readers pick the Grand Canyon". USA Today. Retrieved May 3, 2013. ^ "Natural Wonders". CNN. November 11, 1997. Archived from the original on July 21, 2006. Retrieved July 31, 2010. ^ "The multimedia campaign to choose the New 7 Wonders of the World is in its final stage". New7Wonders. Archived from the original on January 3, 2007. Retrieved June 10, 2015. ^ "Egypt's pyramids out of seven wonders contest". Daily News Egypt. April 20, 2007. Retrieved June 25, 2018. ^ "Reuters via ABC News Australia "Opera House snubbed as new Wonders unveiled" 7 July 2007". Australia: ABC. July 8, 2007. Retrieved July 31, 2010. ^ "Great Wall of China". Encyclopædia Britannica. ^ "Underwater Wonders of the World". Wonderclub. Archived from the original on June 13, 2017. Retrieved August 31, 2010. ^ Kumar, Manjit (November 7, 2003). "Review: Seven Wonders of the Industrial World by Deborah Cadbury". The Guardian. ^ Cadbury, Deborah (February 17, 2011). "British History in Depth: Seven Wonders of the Industrial World". Retrieved March 25, 2015. ^ "Seven Wonders of the Solar System Video:". Aaa.org. 1999. Archived from the original on April 1, 2014. Retrieved February 22, 2014. ^ Clark, Ronald W. (1980). Wonders of the World. Artus Publishing Company Ltd. ISBN 978-0-668-04932-0. ^ Hillman, Howard. World's Top 10 Man-made Travel Wonders. Hillman Quality Publications. Archived from the original on January 10, 2011. Retrieved July 7, 2007. ^ Hillman, Howard. World's Top 10 Natural Travel Wonders. Hillman Quality Publications. Archived from the original on January 9, 2011. Retrieved July 7, 2007. Ash, Russell (2000). Great Wonders of the World. Dorling Kindersley. ISBN 978-0-7513-2886-8. Morris, Neil (2002). The Seven Wonders of the Natural World. Chrysalis Books. ISBN 1-84138-495-X. Wikimedia Commons has media related to Seven Wonders of the World.